on the high and parallel bars, rudimentary feats that I copied from others trying to work out or show off in the playground. Irv was on the high bar doing giant swings with effortless ease. I praised him and we became friends. He showed and taught me various stunts on the bars and flying rings. 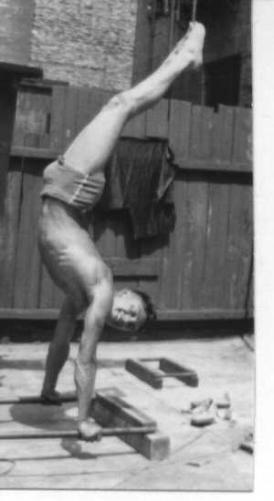 He had learned at the Turn Verein Vorvats, which was one of many private German health and gymnastics Turn Vereins spotted throughout the US and the world,. and asked if I was interested in joining and developing my gymnastic skills. Irv groomed me before he took me to an evening meeting and introduced me to the director, Eric von Weber, who at one time represented Germany on the parallel bars and flying rings in the Olympics. For two years, I spent up to two evenings a week and most Sundays at the gym. Each session started with a lineup and a “Gut Heil” given with raised right arm and forward facing palm. I quit the club as I was being groomed for the Cleveland Turnfest, a private Olympics for Turners. I had learned about body building and gymnastics but also the subtle inroads of racial propaganda became clear when the “Gut Heil” became “Heil Hitler” and the Turn Verein became part of the German American Bund. I still recall my terror, when in 1927 I watched from behind the iron gates in my grandfather’s home in Debrezen, Hungary, as Bela Kun’s supporters marched and yelled anti-Sematic slogans.